President Rodrigo Duterte failed to acknowledge Vice President Leni Robredo in his speech during the commencement exercises of the Philippine Military Academy (PMA) “Salaknib” (Sanggalang ay Lakas at Buhay Para sa Kalayaan Ng Inang Bayan) Class of 2017 at Fort General Gregorio H. Del Pilar in Baguio City on March 12, 2017. In the middle of his speech, he noticed that the name of Vice President Leni Robredo didn’t included by the speech writer. “Yung sumulat nito hindi ka sinali. Bugbugin natin,” President Duterte said in jest. 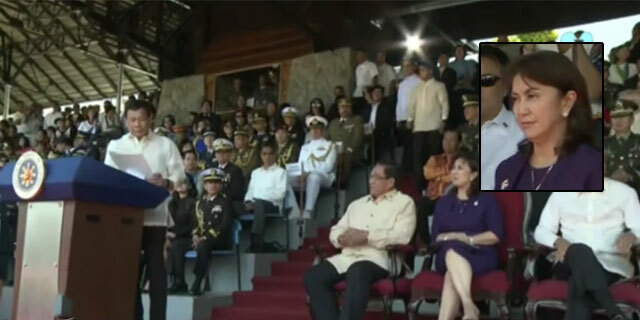 But the commander-in-chief quickly apologized to Vice President Leni Robredo that draw laughs to the audience. “I’d like to apologize . . . and acknowledge the presence of the beautiful lady.. the Vice President of the republic of the Philippines. . . Sorry ma’am, nawala na tuloy ako ma’am,” President Duterte told Vice President Robredo. This is the first time that President and Vice President met since the dismissal of Robredo in the cabinet members. After that, Vice President Leni Robredo became more aggressive in criticizing the government policies. People expected that the meeting between the President and Vice President would became awkward, but in the end the two most powerful public official maintained their professionalism. Before the event started, President Duterte shakes hand with Vice President Leni Robredo.